Another one from CVS, The Pisco Apricot Tropical has a bit of a tiki quality. I was mostly drawn to this recipe on account of the apricot liqueur, which I only recently acquired for the first time, and I have been looking for different recipes to showcase it. The fresh pineapple juice was a bonus, but I always enjoy it immensely. For this reason, I try to always keep a pineapple on hand, just in case I need fresh pineapple juice. Admittedly, there are a couple of cans tucked away in my fridge, because you never know when you’ll need to make an Algonquin or a Kentucky at a moment’s notice. Once you start using a juicer, you will never go back. Pasteurizing juice is just a hair away from murdering it — the texture goes all gummy, and all of the bright flavors depart, ne’er to return. In fact, one of the major components of the recent cocktail revival is that bartenders have stopped using pre-made sour mixes and turned instead to fresh juices, which are superior in every way. If you have ever had a drink made with sour mix, you know just how awful it is, and how far we have come. 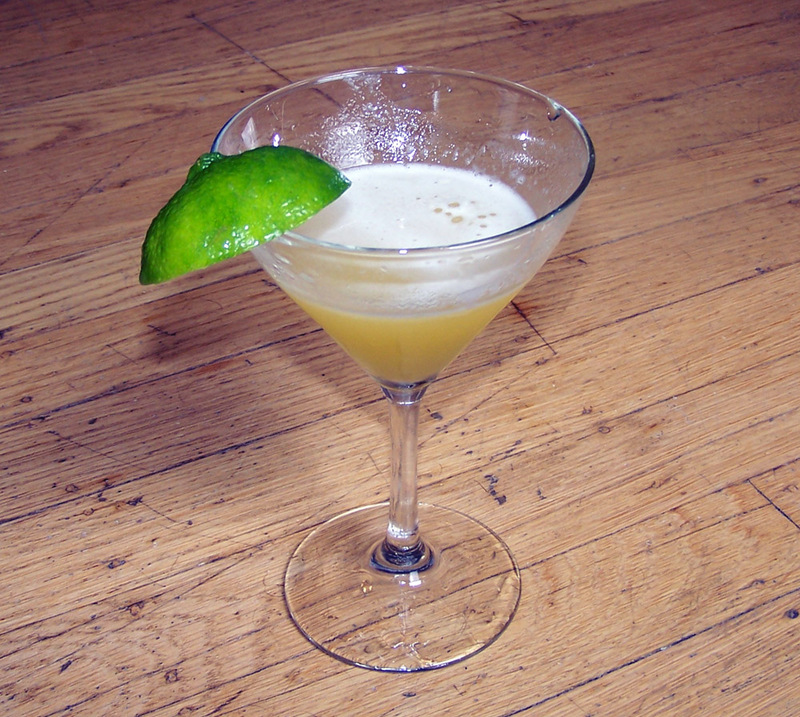 Despite the sweet-sounding recipe, this drink was very dry and stimulating to the appetite. Pisco has a clean, crisp grape flavor, and it was a surprising match to the other fruit flavors in this recipe. They all blended together, and the end result tasted like a dry white gummy bear. The key word here is dry; there was none of the sweetness of candy. This was among the best sours I’ve had all year, but I would definitely drink it as an aperitif, and not for dessert. Categories: modern drinks, tiki | Tags: angostura, apricot, lime, orchard apricot, pineapple, pisco | Permalink. This looks great and I really appreciate your description.